Biotechnology is the advance research-oriented science including a fusion of biology and technology. Biotechnology features the use of living cells and bacteria in the industrial process. 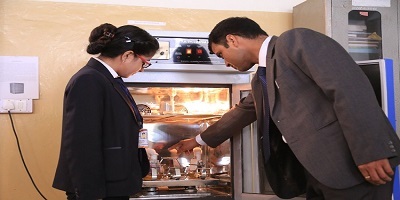 In SDCET Biotechnology Department was started in 2003, all labs are equipped with latest Molecular biological, Biochemistry, Genetics, bioprocess & fermentation and Immunological techniques based equipments, bioinformatics software and high speed internet facility round the clock. Every year department is achieving new goals. Department has excellent facilities and faculty members who have been always a great strength and backbone right from the beginning. Most of the faculty members are doctorate and post graduate and having excellent academic records.